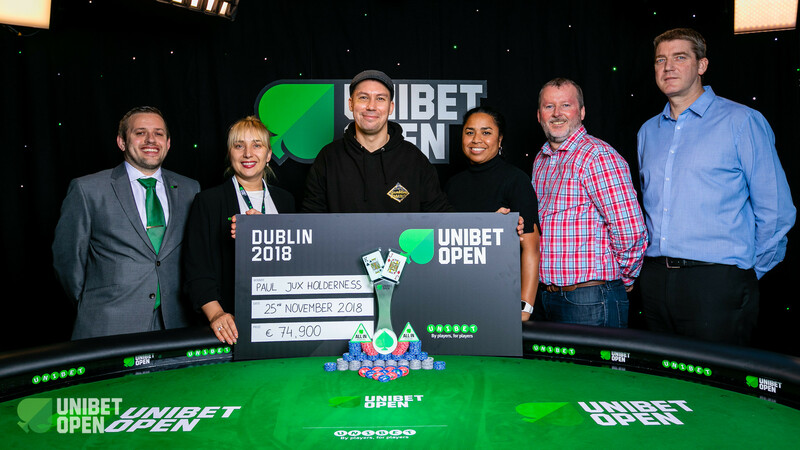 The 2018 Unibet Open Dublin €1,100 Main Event champion has been crowned and it was UK's Paul Jux Holderness that lifted the check and trophy for winner shots at the Bonnington Hotel in Dublin. 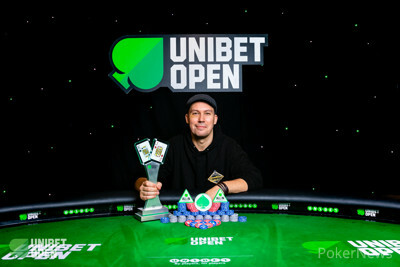 Jux Holderness already finished 3rd in the €2,200 High Roller and the 34-year-old from Bournemouth defeated Frenchman Julien Kron in heads-up to claim the top prize of €74,900, capping off a very successful trip to the Irish capital. Paul Jux Holderness raised to 325,000 with the and Julien Kron called with . Both players flopped top pair on and Kron checked, Jux Holderness bet 325,000 and the Frenchman called. On the turn, Kron checked once more and Jux Holderness carefully cut out a bet of 675,000. 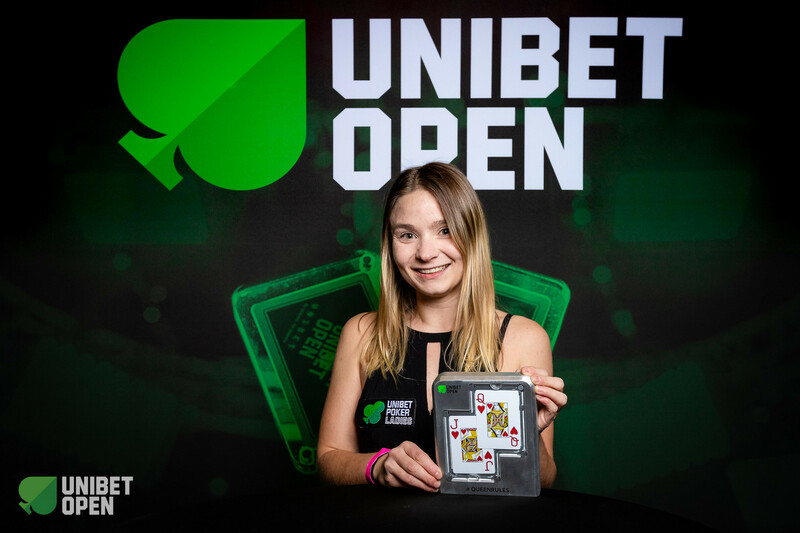 Kron had around 2.8 million behind and moved all in, the snap-call followed and the Main Event champion was crowned even before the on the river further improved Jux Holderness to a full house. 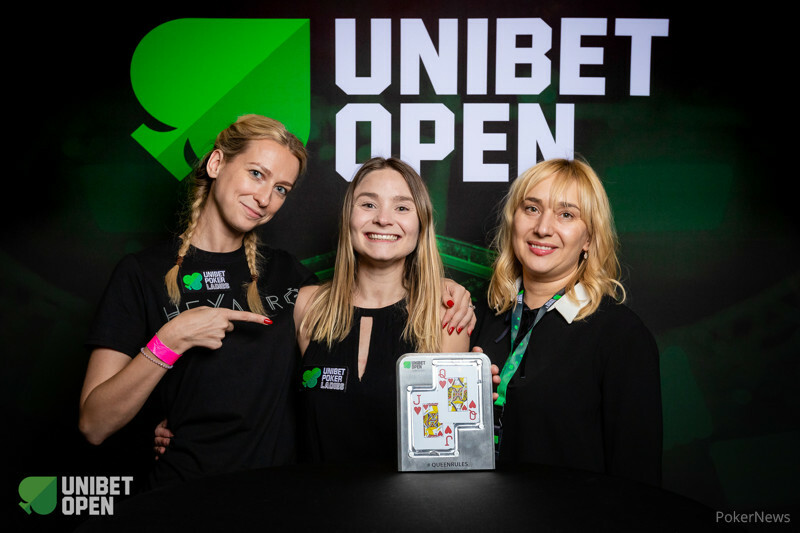 Kron was eliminated in 2nd place for €46,550 and Jux Holderness became the latest Unibet Open champion. A recap of today's action is to follow, as the festival at the Bonnington Hotel has all but wrapped up. 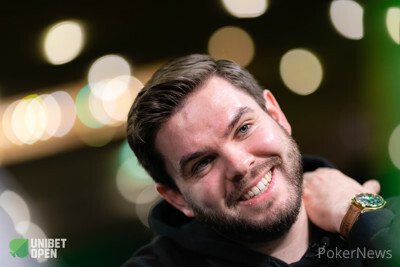 Julien Kron limped in with the and Paul Jux Holderness raised to 350,000 with the , Kron called and on the flop a bet of the Brit did the trick to vault him into the chip lead as Kron quickly released his cards into the muck. Jux Holderness raised to 375,000 with the and Kron three-bet big with in order to force a fold. Kron raised to 325,000 with and Jux Holderness defended the . Both flopped a pair on and Jux Holderness checked to Kron, who bet 325,000 and immediately faced a check-raise to 925,000. Kron elected to call and the followed on the turn. Jux Holderness leaned out of his chair to check the stack of his opponent. The Brit checked and Kron bet 725,000, Jux Holderness moved all in and a quick fold by Kron followed. In a limped pot to the flop, Julien Kron bet 265,000 with the and Paul Jux Holderness check-called with the for bottom pair. On the turn, Jux Holderness led for 475,000 and Kron folded the best hand to see his opponent pull even closer. Paul Jux Holderness raised to 300,000 with the and Julien Kron three-bet to 925,000 with . Jux Holderness had 2.6 million behind and opted to call. The flop brought and Kron continued for 525,000, Jux Holderness came along. On the turn, Kron slowed down and checked, prompting a snap-all in of Jux Holderness to force a fold from Kron. After losing most of the pots so far, Jux Holderness suddenly regained the momentum and jumped back into the mix. Julien Kron raised with the and Paul Jux Holderness defended the to see a flop of , on which he check-called a bet of 225,000. On the turn, Jux Holderness checked once more and Kron fired a second barrel of 425,000. Jux Holderness double-checked his stack and folded. Paul Jux Holderness raised with the and Julien Kron defended the to see the flop. Kron checked and called a bet of 350,000, then spiked the on the turn. Kron checked once more and Jux Holderness bet 550,000 with his pair, Kron opted to flat-call. Kron checked the river and Jux Holderness checked back to preserve his stack.